The origin of Chinatown is linked to Sir Stamford Raffles. In 1822, he formed a Town Planning Committee to plan Singapore Town according to ethnic groups. The area south of the Singapore River was allocated by sectors to Chinese and Indian immigrants of the same provincial origin and language groups. Each group has left its mark on street names and places of worship. The street architecture of Chinatown's buildings, the shophouses especially, combines different elements of baroque architecture and Victorian architecture and do not have a single classification. Many of them were built in the style of "painted ladies"*, and have been restored in that fashion. These styles result in a variety of different colours of which pastel is most dominant. Trengganu Street, Pagoda Street and Temple Street are such examples of this architecture. *"Painted ladies" is a term in American architecture used for Victorian and Edwardian houses and buildings painted in three or more colours that embellish or enhance their architectural details. Formerly plantation land, the area was subdivided and developed into a fashionable abode for wealthy Chinese and Straits-Chinese merchants and their families at the turn of the 20th century. Their dwellings comprised of terrace houses of a variety of architectural styles as well as independent mansions (now demolished). Many feature ornate pintu pagar (door gate), pintu besar (main door). Ground floor façades are decorated with attractive ceramic tile work. Elaborate plaster work and wood carvings combine to create an architectural style known as 'Chinese Baroque'. In 1985, the URA announced that Emerald Hill would be a conservation area, the first in Singapore, in order to conserve some of the best examples of Strait Chinese style of dwellings. The conservation area also includes the development known as "Peranakan Place", which is a row of 6 two-storey shophouses (circa 1902) fronting Orchard Road. The area today is an attractive and quiet residential area with several commercial units in the main shopping zone near Orchard Road. As early as the 1920s, the Joo Chiat area was well regarded as an attractive residential suburb. Prior to urbanisation, the area had first developed as plantations. The post World War I building boom and the introduction of better transport such as buses and trams, facilitated the movement of the relatively more wealthy people out into the East, away from the increasingly crowded city centre. 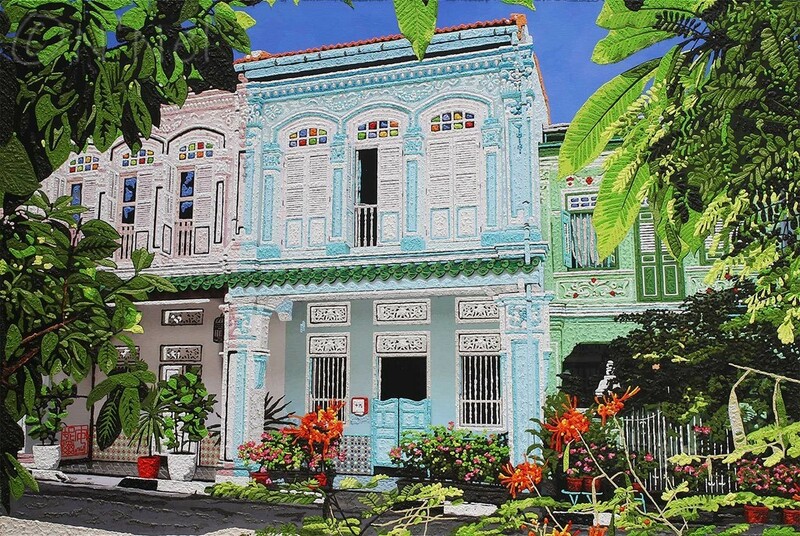 Many shophouses in the neighbourhood were built in the Late-style, known as East Coast Peranakan Style. The most striking feature is the narrow yet elaborately embellished front façade, which belies the depth and spaciousness of the residence. This façade design style is unique to the Peranakan Chineses, who were heavily influenced by Malay culture. It brings out their love for splendid stucco façade decorations, fine wood carvings of upstairs balustrades, pintu pagar (door gate), air vents above the windows and fascia boarding of the roof. Fine tiles imported from France, England and Belgium were applied in great profusion to the external walls and the pillars. The various motifs applied on the façades are often derived from mythical figures. Flowers and birds abound, often acting as an accompaniment to the relief stucco decoration of Chinese motifs such as crabs, deers, dragons and mythical dogs, symbols of happiness, good fortune and long life. A highlight of this style of building would be the cluster at Koon Seng Road. The Serangoon Road area was never designated by Raffles as an area for Indian community, unlike 'Chinatown' or 'Kampong Glam' were for the Chinese and the Muslims respectively. Nonetheless it has developed since the mid-1800s, into the heart of Singapore's Indian community. Now known as 'Little India' the area bounded by Serangoon Road and Jalan Besar, is rich in architecture, culture and history. Serangoon Road was one of the earliest roads built in Singapore. Farms were set up along the road and they produced crops like betel nut, vegetables and sugar cane. Later, cattle trading developed into the main economic activity of the area. The development of other commercial activities in newly constructed shophouses took place as the cattle trade declined.